A call to Camper & Nicholsons brings news that Simon Goldsworthy and Fernando Nicholson have listed the new-build 43m motor yacht Essence for sale. 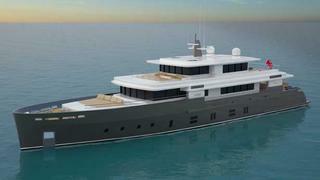 Currently being built by China's Kingship yard to a design by Horacio Bozzo, Essence will be RINA classed and MCA compliant. Accommodation is for 10 guests in five staterooms including a master suite on the upper deck with a private deck. Powered by twin 1450hp Caterpillar engines, she will have a range of 4,000 nautical miles at her cruising speed of 13.5 knots. Due for delivery in 2014, Essence is asking €13.8 million.